1880s/1890s autograph album that belonged to Nettie, presumably of La Rue, Ohio, which was home to most of the signers. From clues in the album, I believe Nettie was Jennetta Price, "Nettie", daughter of David and Mary Eeylyn (Price) Price. I found records with variant spellings of Jennetta, including Jeanetta and Jeannetta, but I've heard from a relative, who tells me that she went by Nettie most of her life. "Nettie" was used on her death certificate and in her obituary. A reader has kindly forwarded a photograph of Nettie (Price) Brown in her middle age. Nettie received the album as a Christmas present in 1887 from Will Bonham. The way he wrote his name threw me at first as it looks more like Bonhan, but I found records for Bonham. 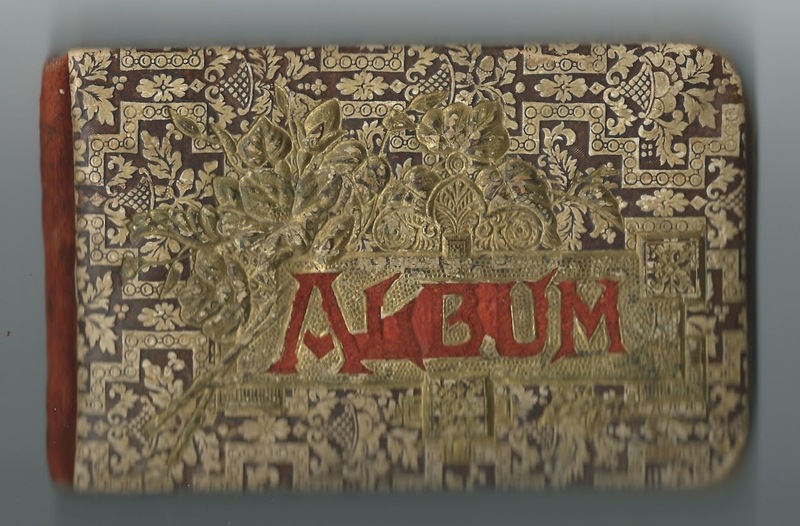 The album measures approximately 6-1/4" by almost 4" and contains the sentiments of 25 of Nettie's relatives, friends and schoolmates. An alphabetical surname list and an alphabetical list of the signers appears at the end of this post. 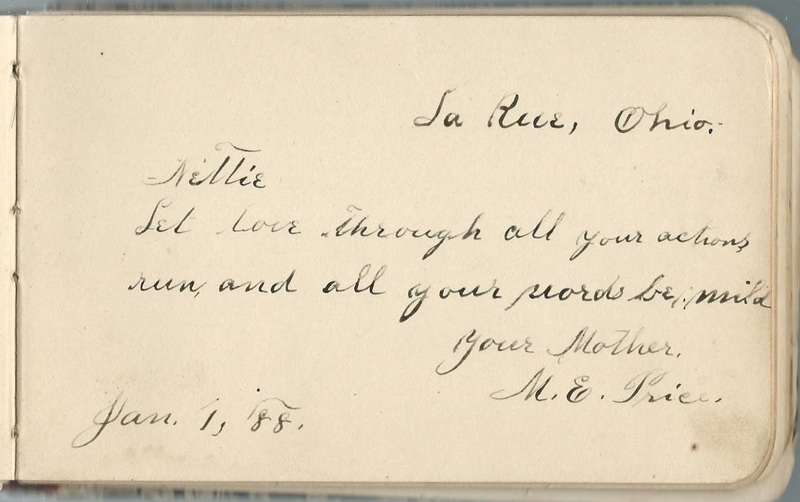 M. E. Price inscribed a page at La Rue, Ohio, on January 1, 1888 and called herself Nettie's mother. She was presumably Mary Eeylyn (Price) Price, wife of David Price. She was the daughter of Levi and Elizabeth (Godfrey) Price, as confirmed in a Family Bible, which I haven't seen myself. David Price was the son of James and Octavia (Watkins) Price, as also confirmed in the Bible. The birth of David and Mary Eeylyn (Price) Price's daughter Jennetta [or Jennette or variant spelling], was also confirmed in the Bible. 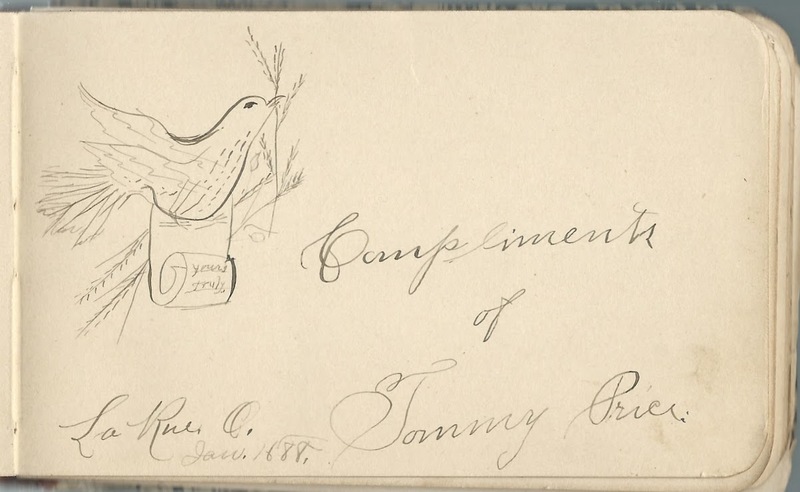 Tommy Price also signed a page at La Rue, Ohio, on January 1, 1888. He didn't mention a family relationship with Nettie, but I did find a Thomas Otto Price who was the son of David and Mary E. Price. Further, he had a sister named Jennetta, who could have had the nickname Nettie. Tommy embellished his page with a bird and scroll. Jennetta Price was born in April 1869 in Ohio. In 1889, she married Henry K. Brown, son of Elijah H. and Belinda (Cloud) Brown. They had at least one child, a daughter. Henry, who was about twenty years older than Nettie, had been married before, and some of his children signed pages in Nettie's album, as you can see from the list of signers below. Reassuringly as to the question of identity, the Find-a-Grave listing for the Browns shows their stone with the names Henry K. and Nettie. They're buried in the Price Cemetery at Richwood, Ohio, where David and Mary E. Price and their son Thomas Otto Price are buried, as well as other family members. 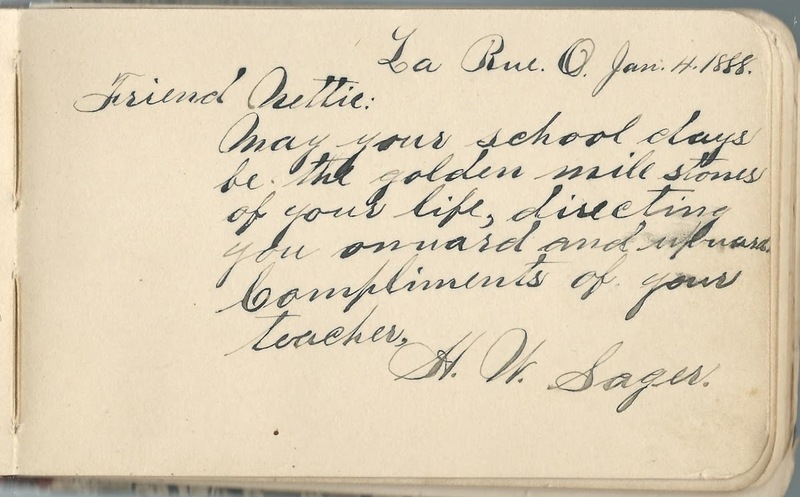 H. W. Sager inscribed a page at La Rue, Ohio, on January 4, 1888, and noted that he or she was Nettie's teacher. He may have been Henry Wilber Sager (1862-1945), son of Benjamin F. Sager and Sarah Catherine (Cowger) Sager. He's also buried in the Price Cemetery at Richwood, Ohio. If you have corrections and/or additions to the information above, or you feel that Nettie is not Jennetta (Price) Brown, or information on any of the signers listed below, please leave a comment or contact me directly. S. B. of La Rue, Ohio, signed on January 14, 1888; Nettie's schoolmate. Middle initial could be V or N.
Mrs. Henry B?, signed at Marion, Ohio, in March 1895 [or 1892]; surname might be Breslin or Bossler or ? 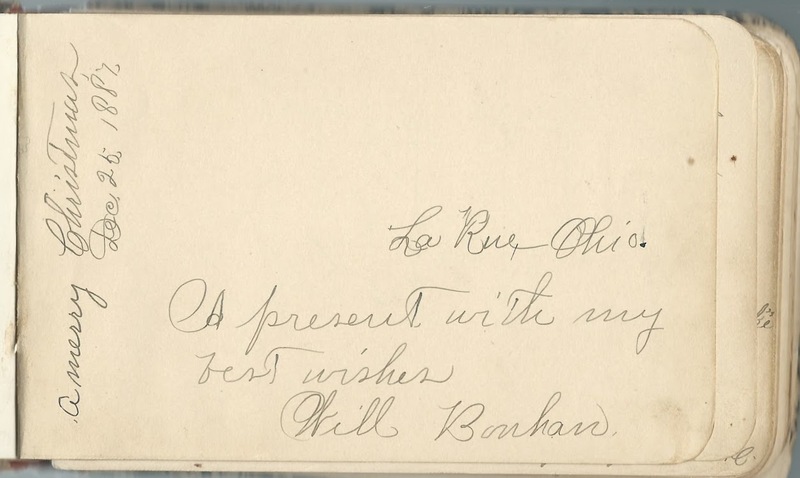 Will Bonhan or Will Bonham; presented the album to Nettie as a Christmas present in 1887 at La Rue, Ohio. Libbie Johnson, signed at La Rue, Ohio, "At School"
Nettie of La Rue, Ohio; album owner; later on in the album she inscribed a page of welcome to her well wishers; presumably Jennetta Price, "Nettie".